THE garden of a man’s Eden, if he ever has one is, we fear, oftener at the beginning than at the end of his life. Why is it so? Something undoubtedly has to be set down to the freshness and exuberance of childhood, and over against that the relaxation and decay of age; yet, if a man‘s gift and time are spent in the service of God he may find the last days to be his best; days of sunshine and peace. The subject of this sketch, who has for many years been a prominent member and official in our church at Ramsgate, Ashford, and in London, and is now living in the Bradfield Circuit, was born seventy-four years ago. His entrance on life was in the village of Hollinsboume in Kent. This was probably a very pretty village, standing amidst undulations of hill and vale and orchards and hop gardens, but such was the social, intellectual and spiritual poverty of his parentage and that of the people in general, that his faint recollections are not of an Eden life. Very early the family removed to London, and here the circumstances were not such an improvement as to leave behind the recollection of the lily and the rose, or of a happy home and kindly neighbours and friends. His father died early, leaving his mother with a family but poorly provided for. He himself was sent to live with his grandfather. Here, beyond attending church on Sunday, he had nothing to remind him of God, and of his own responsibility to live a good life. The days of his youth were full of hardship and privation, and his onward journey lay amidst dark shadows, over stony paths swept by many a storm. The real life, the life worth living, began at the point of the second birth. His natural gifts and energies underwent a great quickening, and he soon entered on a more prosperous career. The way was prepared by impressions made on his mind in a Sunday school whither he had been sent by his mother. ‘These were deepened by hearing the Rev. John Stamp, one of the early missionaries, while his conversion took place under a sermon preached in the Ramsgate Chapel by the Rev. E. Rust. He says, “I now got blessedly saved.” Joining the society, he made rapid progress, and in three months he became a local preacher. After some years’ service on the Ramsgate station he married the daughter of the Rev. W.G. Belham, and removed with his wife to Ashford, a town some miles inland. The cause here had only lately been planted, and was but weak, consisting of two persons, a blind woman, and a person by the name of Nixon, related to the family of that name that holds an honourable place in the early history of our church at Tunstall. Brother Kidd felt his loyalty a little strained, but soon decided, and joining the weak pair, he laboured and suffered and not in vain. The Ashford Society at that time formed a part of the Maidstone Mission, and was superintended by the Rev. J. Guy, who came and preached once a fortnight on a week evening. The situation was central, lying half way between Maidstone on the River Medway, and Folkestone on the coast of the Straits of Dover. It was a large field, and the life of town and village was largely dominated by the world, the ?esh, and the devil. It was an arena of terrible conflict, but the strength and courage of our brother was equal to the task. He travelled in every direction and preached the word, mostly in the open air, under the trees, on the village green, or under the shadow of the spire of the parish church. The journeys varied from a few to seventeen and eighteen miles each way, and at times he had to return without a bit or drop, reaching home about midnight and even as late (or early) as three o’clock in the morning. On one occasion, after attending the district meeting, and hearing Messrs. Bywater, Harland, and Toulson, he says he was so filled with the glory that it seemed that his feet scarcely touched the ground. After spending several years at Ashford, he removed to London. He entered the great city a lone man; but carrying his plan in his pocket he found out one of our chapels, and secured accommodation with one of our people. He took a business, and after a time arranged for the removal of his wife and family. He speaks affectionately of the society at Cubitt Town, and has a good story to tell of the part he took in paying off the debt, and in promoting the enlargement that followed. Here he held the office of leader, society steward, and preached over a wide area, extending to Walthamstow and Barking in the east, and to Plumstead and Woolwich over on the other side of the river. He removed at length to Woodford in consequence of his wife’s failing health, where he served our church under the jurisdiction of the Rev. 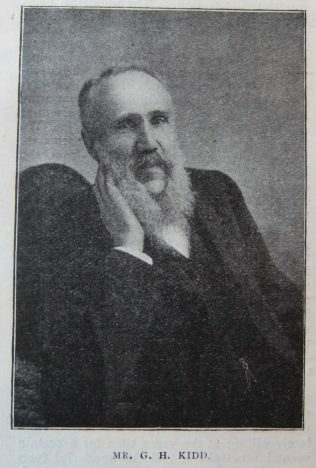 R. S. Blair. Then, at the death of Mrs. Kidd, he returned to Ramsgate, where he rendered good service as the Circuit steward. He has now lived at Theale, in the Bradfield Circuit eleven years. We think of him as our grand old man, and look to him as a peer of our realm. He is not bowed down as some aged men are, nor has he a sorrow-stricken and woe-begone look. He is stately, dignified, and his disposition is as bright and sportful as that of a youth. He lives in a good house surrounded by a lawn and garden, with flowers, vegetables and fruit-bearing trees. On the marriage of his daughter with the Rev. J.W. Grayson, he took to himself a second wife, who attends him with the greatest consideration and kindness. The preachers are welcome guests. Time was when the entertainment of friends, especially on the occasion of a camp meeting, exhausted his store. The store holds good now, and we do not think that there is any fear of want. Mr. Kidd is the Steward of the society, gives good counsel in our business meetings, attends all the services; and preaches as far as his strength will admit. George was born abt 1830 at Hollingbourne, Kent, to parents John and Mary. John was a grocer (1841). His obituary records that George’s faith and preaching were evangelical and “old-fashioned,” but he was greatly sympathetic and attractive to the young. George married Margaret Belham (1834-1881) on 2 October 1854 at St Peter, Ramsgate, Kent. She was a daughter of Rev. W.G. Belham. Census returns identify three children. George died on 12 January 1908 at Theale, Berkshire.